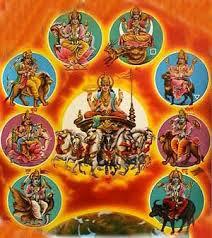 Vedic Astrology is the astrology of India. It is said to have been intuitively perceived thousands of years ago by the same ancient mystics who developed the various techniques of meditation and yoga for which India is so well known. It is called "Jyotish", which means "the light", because it is used to illumine the life, providing both practical and spiritual insight. The term Vedic comes from the word Veda, which literally means knowledge. True knowledge is said to be transcendental, and the real experience of "the Veda" can only be directly perceived by the enlightened mind. Out of compassion for mankind, however, ancient seers composed four sets of hymns called the Vedas, which are expressions of various aspects of knowledge such as philosophy, yoga, meditation, healing, and other sciences. They are designed to help humanity in the quest for happiness, peace and fulfillment. Jyotish, which technically is a Vedanga or limb of the Vedas, is considered to be "the eye of the Veda", the science which helps one see the life path. It is the mother of all other sciences. It includes Astronomy, mathematics, cosmology, omenology, the setting of auspicious times, divination based on questions, and the interpretation of horoscopes. According to Prashna Marga, a great classic of Vedic Astrology, the proper study of this science leads one to "the acquisition of wealth, karmic merit, salvation, respect and fame." The original jyotishis were both expert astronomers and enlightened sages. They made their calculations directly, by looking up at the heavens. Using stone observatories, sun dials and various other simple astronomical tools, they mapped the heavens and accurately plotted the movements of planets. For thousands of years, they watched the night sky and divided the zodiac into various divisions, including signs (sections of 30 degrees), Nakshatras (13 degrees 20 minutes), Navamshas (3 degrees 20 minutes) and even Shashtyamshas (tiny sections of 1/2 degree). They went on to describe the forms and symbols they could see in the heavens and they linked each planet, sign and constellation with a particular god or goddess. They meditated deeply and began to tell the stories of these gods based on the symbols they saw in the heavens. These stories were told and retold down through the ages around campfires, in temples, and finally, some of them were written down. They are myths and stories full of symbolism, which illumine basic psychological archetypes. In this way, Jyotish has always had a strong story-telling foundation. Mastering Jyotish requires more than a mere technical understanding of the subject. It requires a thorough grounding in vedic philosophy and mythology, an undertaking that, by itself, could take a lifetime. The artful use of storytelling by the vedic astrologer will touch the deepest chord within the client, linking him to his own personal mythology. The ancient seers who developed Jyotish possessed deep wisdom, but they were also very practical. They sought to solve the age-old problem of human suffering by providing tools such as yoga, meditation, Ayurveda and Vedic Astrology, which assist men and women in their quests for happiness and fulfillment. Ultimately, all of these tools aim at producing enlightenment, a state of consciousness characterized by infinite bliss, unbounded awareness, deep abiding peace and freedom. Yet the ancient seers understood that, for the average person, the path towards enlightenment need not be one of austerity and deprivation. They outlined four worthwhile aims of life, dharma (law, duty or purpose) artha (material wealth) kama (desire, pleasure, affection, emotion) and moksha (liberation or spiritual freedom). They designed Jyotish as a tool that helps a person achieve all of these aims so that life, in both spiritual and material aspects, can be a joyous event culminating in enlightenment. The ancient India that produced the Vedas was located in the northwestern section of modern India now called the Punjab. While most conventional historians assign the Vedas to the period between 1500 and 900 BC, modern archeological evidence suggests that they are much older, and that the Vedic culture may even be more than 8000 years old. This ancient civilization centered around 7 rivers, the largest of which was called the Saraswati. This was a fertile agricultural land, where crops thrived and trade flourished. As villages and cities began to grow, two cities in particular, Harappa and Mohenjodaro became great centers of civilization. These cities were highly developed, with an organized political structure. They were laid out in a meticulous geometric pattern. They had brick houses, some with bathrooms, where the inhabitants bathed using a pitcher of water that drained out of the house into an intricate drainage system. Only the Roman drainage systems, more than 2000 years later, compared with those of ancient India. The inhabitants of these cities were multi-ethnic, and several languages were spoken there. The people were also skilled in Mathematics. They were farmers, merchants, seafarers, priests, artisans, and crafts people of various kinds. In short, the cities of ancient India were highly developed and sophisticated by ancient standards. Around 2000 BC, however, due to catastrophic geological changes, the Saraswati River and its tributaries dried up. This led to a migration to the Ganges River valley, which became the center of the cultural development that produced Modern India. The Rig Veda, the most ancient of the 4 Vedic Texts was written well before this cataclysm. Its text constantly refers to the land of 7 rivers and specifically to the Saraswati.The life of Krishna and all the events depicted in the great epic, The Mahabharata, also took place in this region, probably about 3000 BC. The Rig Veda also mentions specific astronomical configurations which suggest that Vedic culture might even have existed as early as 6000 to 7000 BC. Although there is no archeological evidence that Vedic texts were in existence at that time, it is well known that Vedas were originally preserved through an oral tradition. At first, fathers taught their sons. The secrets of Vedic astrology were memorized and jealously guarded within families. Later, many astrological works were written down, first on palm leaves and later in books. 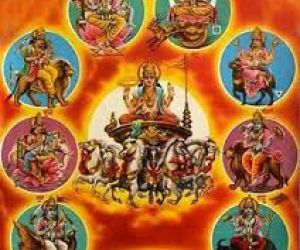 One of the most important ancient astrological works is the Brihat Parashara Hora Shastra, which is attributed to the great sage, Parashara, who lived at the time of the Mahabharata war, about 3000 BC. Although Parashara is taken by many astrologers to be the Father of Vedic astrology, references in the Rig Veda suggest that Jyotish was a developed science even before Parashara's time.It is also more likely that Parashara's Hora Shastra was a compilation of the writings of astrologers who belonged to Parashara's lineage and was actually written down much later, probably evolving into its present form by couple of thousand years after Parashara's time. In this way, the ancient science of Jyotish has been passed down through a tradition that has lasted for more than 10,000 years. It also has the distinction of being practiced in essentially the same way since ancient times.